The Vancouver Canucks have solidified their Center position for years to come. The club announced Friday that they have re-signed Ryan Kesler to a six year, $30 million extension. The announcement comes amidst another career year for Kesler, as he had recorded three straight 20 goal seasons, and a career high 66 points in only 71 games so far this year. When drafted, Canucks fans may recall he was touted as a lock to make the team, but was deemed to not have very much potential to be anything more than a third-line checking forward. 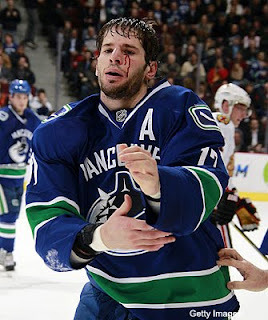 Fans and media criticized the Canucks for not taking a chance on a flashier European forward at the time, citing the team's poor draft record as an indication of the future for Kesler. Despite the criticism the selection drew, Kesler was a consummate professional, dedicated to improving his game and becoming a star in the NHL. Unlike his former college teammate R.J. Umberger, he signed a contract with the Canucks almost immediately and showed determination in making the NHL. Kesler struggled to find his consistency the first couple of years in the league, in part due to being hampered with various injuries, but he has really come into his own in the past couple of years. Criticized last year for setting a personal goal of 80 points in a season, many laughed at Kesler, who's career high at the time was only 37. He improved greatly however, registering 59 points last year, and he is on pace for 76 this year. This year is proving to be very fruitful for Kesler. In addition to the new 6-year $30 million contract, he was also named 'Cover Athlete' for the NHL 2K11 video game, and won a Silver Medal with Team USA in the Vancouver 2010 Olympic Winter Games last month. With the Sedin twins, Roberto Luongo, Ryan Kesler and Alexandre Burrows locked up long term, the Canucks promise to be a solid team for the next few years.